This article is about the quest. For the dragon, see Durnehviir (dragon). Learn a dragon shout from Durnehviir. Spend three dragon souls to learn the words of Durnehviir's shout. 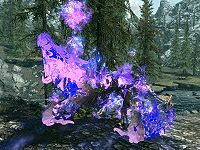 Summon Durnehviir three times while outside of the Soul Cairn in order to learn Soul Tear. After defeating him in the Boneyard, Durnehviir will rematerialize outside, hailing you as his Qahnaarin. He will express his surprise and admiration of your fighting ability, stating that he has never been felled on the fields of the Soul Cairn before. He will then recount the tale of how he came to be bound into the service of the Ideal Masters, explaining that he was deceived after he sought their power to help establish his dominance among his fellow dovah on Nirn. He will then teach you how to summon him back into Tamriel, promising to reward you each time you set him free. Each time you do so, he will teach you another word of Soul Tear, a powerful shout that deals a large amount of damage and doubles as a Soul Trap and Reanimate Corpse spell. Moreover, after being summoned Durnehviir will also explain the meaning of each of those words. The first time he will be very glad to breathe Nirn's air once more: "Ah! The free air of Vus at long last. As promised, I now teach you the first word of Soul Tearing: "Rii" - the essence of your enemy's life force." As you summon him for the second time, he explains yet another word: "I can feel my strength returning each time I am set free from that prison! Hear now the second word of Soul Tearing: "Vaaz" - meaning to tear your enemy's soul from its living vessel." Unlike the Ideal Masters, this Dragon even after all the years of imprisonment, holds on to his honor and teaches you the third and final word of the Soul Tear shout, just as he promised: "You have kept your side of the bargain, now let me fulfill mine. Feel the last word of Soul Tearing within yourself: "Zol" - the unlife that results when a soul is imprisoned in dead flesh." Each word will require a Dragon Soul to learn, as if it had been learned from a word wall. You will need to activate all three words of the Summon Durnehviir shout in order to call him, which will require three Dragon Souls. Unlike the Call Dragon shout, the Summon Durnehviir shout works like a Conjuration spell. You have to aim it at the ground and have enough space around the point of summoning for the shout to succeed. This also means that you can summon him within certain enclosed areas such as caves as long as there is enough room. It is possible for you to learn the shout, but never be able to summon Durnehviir. This can happen if the game gives you all three words at once, and you leave for Tamriel without speaking to Durnehviir again before exiting the Soul Cairn. Use the console command player.placeatme xx00C71A. Kill the dragon that spawns, either using the console or otherwise. This will have to be done multiple times to get all the quests. It is not necessary to summon Durnehviir to Tamriel. Summoning him in the Soul Cairn will have the same results and dialogue. It is possible to kill Durnehviir when he appears a second time before he gets a chance to speak. The quest will then never initiate. You can reset the quest and then set stage it to 30. It's possible that Durnehviir will disappear (be banished) shortly after summoning him, even not being able to finish his sentence regarding the Thu'um he is teaching. This, however won't prevent the acquisition of the word. A possible solution seems to be pressing action (Activate; PC: "E") key pointing at Durnehviir while in the close proximity right after summoning him, as if one would like to interact with him. It will be entitled "<player_name>'s Durnehviir", similar to how any other summoned creatures are described. The partial solution is to quick save before summoning him and try - if he vanishes quick load and try summoning him some place else, even if it's only a few steps away. 30 I have made a pact with the dragon, Durnehviir. I will agree to summon him to Tamriel on occasion, and in return he's agreed to fight by my side and teach me his unique shout. 60 I've now fully learned Durnehviir's shout by summoning him to Tamriel. Our agreement appears to be mutually beneficial, and therefore I'll continue to summon him as I deem necessary. DLC1VQDragon: 0, 10, 20, 35. On the PC, it is possible to use the console to advance through the quest by entering setstage DLC1VQDragon stage, where stage is the number of the stage you wish to complete. It is not possible to un-complete (i.e. go back) quest stages, but it is possible to clear all stages of the quest using resetquest DLC1VQDragon. This page was last modified on 5 November 2018, at 05:00.